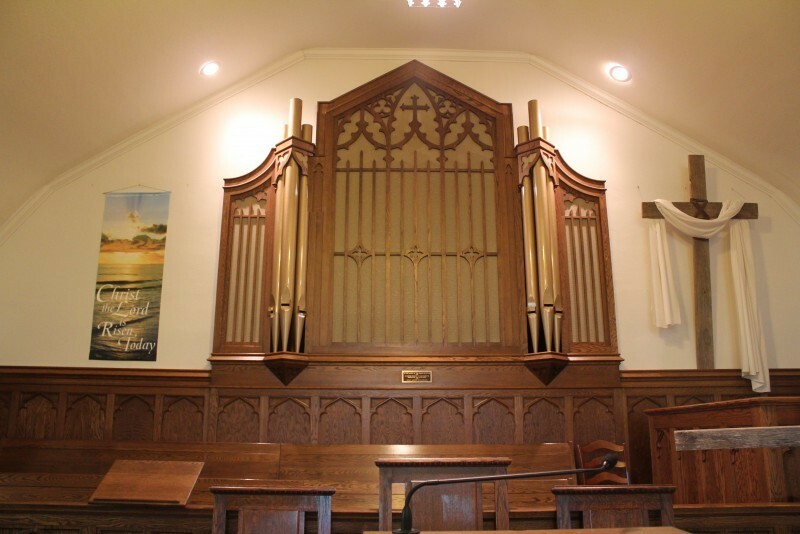 In 1942 the First Presbyterian Church of Gothenburg held a special service to commemorate the installation of the pipe organ and reredos that still grace the front of the Sanctuary. An explanation of the symbolism of the reredos was provided. I present here that explanation. “The significance of the symbolic design of the Reredos is based on the ancient symbols used in our early Christian History. The Trinity is most definitely expressed in the Trefoils which flank the center arch in the center grille. The trefoil is formed by three intersecting circles within the circle. The three intersecting circles represent the three persons in the Godhead and since they are intertwined, they express their indivisibility as being three persons in one and being of equal size, the three persons are represented as being of equal importance. The outer circle is the symbol of eternity because it has no beginning and no end. The Trinity is further expressed in the three arches which form the centered grille, in the three pipes that form each group of pipes and in the three sections of grille work that form the entire reredos. The cross is a floriated Latin cross. It is the actual form of cross that was used in the crucifixion. The significance of the bare cross is that the sacrifice has been made and the victory won. The three more-or-less diamond figures enclosing a four-pedaled figure, located in the center part of the center grille, represent the four gospels. You can also divide the Reredos into five parts to represent the five wounds Our Lord received, seven parts to represent the seven days of creation, the seven last words of Christ on the cross, the seven Christian virtues, the seven deadly sins, and the seven gifts of the Holy Spirit (Courage, Prophesy, Wisdom, Strength, Honor, Glory, and Blessing). The Reredos was designed by Mr. A.G. Sabol of Lawrence, Kansas and built by the Reuter Organ Company of Lawrence, Kansas."